**ART*JOURNAL*JOURNEY*: NEWS - please read! Please tell everyone you know, and please visit her as she could use your support right now! and I am delighted to be hosting Art Journal Journey for this month and hope you will enjoy the theme. I am a textile and mixed media artist, but have only been Art journalling for a few years. I live in Herefordshire in the UK, and for this theme I have used my family and my garden quite a lot. So please forgive all the family shots, as that is where much of my fun comes from. and the example is of my daughter’s dogs having fun on the beach in Cornwall. Can't wait to see your pages! And as always please adhere to our few rules. Glad you like the theme, Gill. I think it's going to be a fun one, too. ha, perfect theme, wendy! 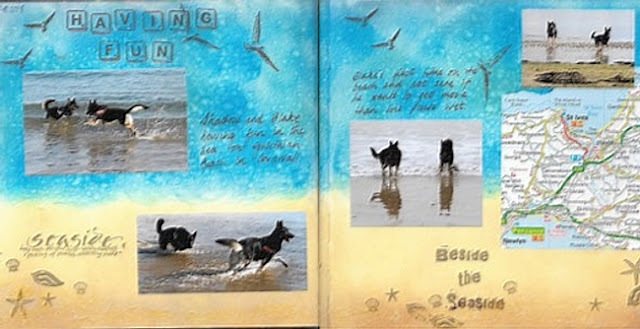 love your journaled spread - spending time at the seaside always is uplifting! I saw the pieces you have created, Johanna. I can tell YOU were having fun with this theme. Wonderful theme ~ and I'm looking forward to see what percolates in my journal this month! I look forward to seeing what percolates, too, Rose. I'm also sure it will be fun. Its a fantastic inspiration spread for the theme Wendy. I'll join in soon. Can't wait to see what you come up with, Yvonne. You are so supportive of AJJ. oh how joyful is this journal spread...wonderful theme Wendy! Looks like you have found time to have a bit of fun yourself, Linda. Thank you for always being so supportive of AJJ, dear Chris. I also love this theme, Tracey. It's one that we can relate to, I think. I off to check out your fun art, now, Sari. So glad you have joined us this month. Fabulous spread and theme! Just entered mine. Thanks for the challenge! You gave us a really fun entry, too, Drea. Hello! Thanks for the theme, which inspire us to do wonders. I inspired with my friend to fly. We all can do same in our imagination. I think you make great art, have a great imagination, and one that helps you fly, too! Love your layout! I should do a layout instead of a journal page as I am more experienced with scrap layouts! But tried a journal page. Thanks for letting me join in. We were thrilled to see your entry at AJJ. I was impressed, too. Dogs have fun - wonderful page full of live! I like this theme, Wendy! Delighted that you are enjoying this theme, Rike. I'm enjoying your fun art, too! This is a fantastique theme and a wonderful spread Art journal page Wendy !! Thanks so much. Love your dogs ! Fun fun ! Wish a very happy and funny month ! Wendy you choose a brilliant topic for this month. I love your page you created for us. Super dass Du wieder mit dabei bist! It looks like you had fun with it, too, dear.